At Rosetree Glass Studio and Gallery, Mark Rosenbaum creates distinctive glass work using 2,000-year-old techniques. Mark has a diverse artistic background including glassblowing, glass casting, ceramics, and jewelry. His work has been featured throughout the United States in fine craft stores, art galleries, businesses, and homes. 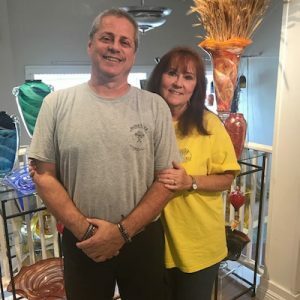 Rosetree Glass Studio is the perfect place to find a one-of-a-kind piece. In 1983, when I received the first Masters of Fine Arts degree in Glass Blowing from Tulane University, I could not find work because there were not any glassblowing studios in the South. I knew that if I wanted to continue working in glass, I had to open my own business. I started with a small studio and opened Rosetree in 1992. It’s been growing ever since! New Orleans businesses are very southern, so hospitality is huge. When you walk into a big box store, it doesn’t have the same charm and character as a small family-owned store. New Orleans epitomizes that mentality. When you walk the streets, people look you in the eye and say, “How you doin’ today, baby?” New Orleans shops reflect that. My ideal customers are people who are looking for something unique to dress up their home or a unique gift for someone special. All our pieces are handmade, so each is different, and people come here looking for that. They want a piece that fits their style and makes their home a little bit more joyful. If your shop was a cocktail, what kind would it be? I would say absinthe. Absinthe is so New Orleans, and it has flames! We literally make our products using flames. We make a variety of hand blown glass pieces in front of a furnace that can fit in anyone’s home. How do you define “success” in your business? Success as a glass blower has a lot to do with growing: growing your skills, growing your collections, and growing your business. I’m constantly adding new pieces to Rosetree’s established lines. Competing with imports and knockoffs is the biggest problem for my business. However, as long as we can give our customers quality artwork that is above and beyond what’s being put out by imports, that’s success in my business. What are your current or any upcoming goals for your business and community? Rosetree is expanding our experiences within the business. We do what we call “Blow Your Own” on Saturdays (except the hot summer months) where people can come try their hand at glass blowing and make their own piece. Rosetree is building quite a reputation for it. We’ve been doing it for about seven years or so, and it’s gone from four weekends a year to almost every weekend all year long. As for the community, I do a lot of work with the other businesses in Algiers. Our goal is to make our small business community a destination. I was one of the original founders of “Wednesdays on the Point” which started as a vehicle to bring customers to Algiers Point during the slow summer months. We had stages set up in front of a different business each week to bring people in. The event series has changed over the years, but I’m still invested in the business community here. The Algiers Point businesses have also been increasing our marketing efforts. We just put out a brochure, have online videos highlighting our local businesses, and a new website, visitalgierspoint.com. We want to get our information on the ferries and in the ferry terminals so visitors can easily find all the great businesses and attractions the neighborhood has to offer. Will you share your favorite local lunch or dinner spot? My wife and I went to Seither’s on Saturday night in Harahan and it was awesome. However, my number one go-to restaurant is Brigtsen’s. That’s where I go if I have friends or family in town. What advice would you give a new business owner? Take business courses. Even basic business courses help a lot. The courses teach you how to manage your books, market your business, and accomplish your goals. In addition, find a mentor. You can make a lot of mistakes when you’re running a business, and it’s a lot easier if you learn from other people’s mistakes as well as your own. I didn’t have that when I got started, and it’s been a learning experience the whole way.